Bridgestone Potenza S-04 Pole Position tires are designed especially for drivers of high performing sports cars, coupes, and sedans who want a tire to match that performance. The good news is that you will get that in this new Bridgestone model. This summer tire has an asymmetrical tread design that sports a larger outboard shoulder, tread blocks that interlock and of course, a circumferential rib for enhanced steering control on dry roads. The cornering and stability on this tire at high speeds is amazing. The tread blocks are designed in two ways: the longitudinal (for stiffness) and the lateral (to avoid hydroplaning). It is also designed with an added circumferential rib that works together with the inner shoulder blocks to reduce noise and wearing. Inside the tire are dual steel belts that are strengthened by a spiral wrap of aramid or nylon for a better ride quality, speed and most importantly, increased durability. The sidewalls of the tire are equipped with rubber inserts for better cornering grip and a more comfortable ride. Overall, the Bridgestone Potenza S-04 Pole Position has to be considered one of the best high performance summer tires you will find available today. They grip like glue in the corners and handle wonderfully on wet roads. Yes, they are pricey but the tread life is far above what you might expect from a tire in this class. Highly recommended. 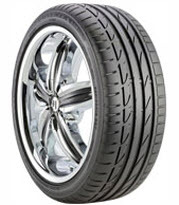 Prices on the Potenza S-04 Pole Position tires range from around $150 on the 16 inch series tire to approximately $300 for the larger sizes in the 20 inch series tires. Who Are Bridgestone Potenza S-04 Pole Position Tires Designed For? Bridgestone has developed the Potenza S-04 Pole Position for drivers of high performance coupes and sedans who seek an ultra-high performance summer driving tire that provides excellent handling and grip on dry or wet pavement, while also giving you a quiet ride and long tread life. Bridgestone does not have a mileage warranty on the Potenza S-04 Pole Position as you might expect. However, you will find a first 1/32 inch of wear guarantee on the uniformity of the tire. Materials and workmanship are covered for 5 years and include free tire replacement during the first 3 years. A prorated amount is then given for the remaining time period until there is less than 2/32 inch of useable tread depth left on the tire. Bridgestone also includes their 30-day buy it and try it guarantee so that if you are not completely satisfied you can refund or exchange the tires.